Make your brand stick with roll labels. Labels spread your brand with every product sold. 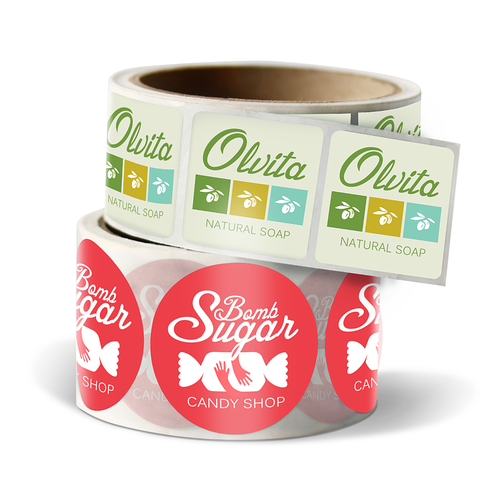 Our customization options help you create the labels that suit your brand the best. Print quantities as few as 25 or as many as 100,000 in a single order and have them ready in as soon as 48 hours. High-quality roll labels are one of the most cost-effective marketing tools you can have in your arsenal. Add your logo to them, then share and cultivate your brand with every single one of your products that appears on a shelf or is shared by your customers. Use them on craft brews and baked goods, or whatever product your heart desires. Use them for branding by themselves or to supplement other print materials. Custom roll labels even maximize employee and production time, because you can label quickly (and brand at the same time). You can even use custom labels for event promotions and political campaigns. With personalized designs, they are also popular for labeling gifts. Whatever you need them for, we have a variety of label shapes, sizes, and stocks to fit any application. Every roll of labels is conveniently rolled and boxed before it is shipped to you, which makes application and storage much simpler than with loose labels.